'This is one of the worst storms to hit the East Coast in many years,' President Donald Trump warned on Twitter. Charleston: Powerful Hurricane Florence was tracking towards the US East Coast Tuesday, prompting authorities to order upwards of one million people to evacuate the path of the extremely dangerous storm forecasters said could soon intensify. Residents scrambled to flee en masse as the menacing Category 4 storm packing winds of 140 miles (220 kilometers) per hour bore down on the East Coast of the United States. "This is one of the worst storms to hit the East Coast in many years," President Donald Trump warned on Twitter. "Please be prepared, be careful and be SAFE!" South Carolina Governor Henry McMaster ordered as many as one million residents of the state's eastern coast to leave their homes ahead of the storm's possible arrival on Thursday. The governor of neighbouring North Carolina ordered an evacuation of the Outer Banks, barrier islands that are a popular tourist destination, and parts of coastal Dare County, while a state of emergency was declared in Virginia. "This is a very dangerous hurricane," McMaster said, adding that the evacuation order for coastal counties was "mandatory, not voluntary." "We do not want to risk one South Carolina life in this hurricane," the governor told reporters. "We're liable to have a whole lot of flooding." Hours later Trump approved emergency declarations for both coastal states, a standard move allowing the release of federal funds and equipment to aid in protection and recovery efforts. The US president said he had spoken with governors of threatened states, adding that the "federal government stands by, ready to assist 24/7." A Category 4 on the five-level Saffir-Simpson hurricane wind scale, Florence was 465 miles south-southeast of Bermuda and the centre of the hurricane was forecast to pass between Bermuda and the Bahamas on Tuesday and Wednesday, the National Hurricane Center (NHC) said in its 11:00 pm (local time) advisory. Forecasters expected some strengthening in the next 36 hours, as Florence marched west-northwest at around 13 miles per hour. At a hardware store in downtown Charleston, South Carolina, store manager John Johnson said the rush on batteries, flashlights, plastic tarps and sandbags began Friday. "From eight o'clock 'til two we were slammed," said Johnson, who sold scores of bags of sand over the weekend, saving just a few to barricade the store's own doors. "We were nonstop." Nurse Barbara Mack was using a small shovel to fill sandbags at a public works facility in Charleston -- but she saw a silver lining in the hurricane preparations. "This is probably the only exercise I get this week," she quipped. Also out for sandbags was Deborah LaRoche. Half her supply was going to barricade a basement soup kitchen she managed, and the other half was going to protect her own home on nearby Johns Island. She and her husband would decide Tuesday morning whether to evacuate their family of two kids and a dog, said LaRoche. Having grown up in storm-prone Florida, she said she's careful not to underestimate any hurricane. "It doesn't matter what happened in (previous) storms," said LaRoche, a social services director. "This one is different." Storm surge and hurricane watches may be issued early Tuesday for portions of southeastern US states, the NHC said. On its current track, Florence is expected to slam the Carolinas and Virginia the hardest. "Don't concentrate on the exact forecast track of Hurricane #Florence. Significant effects will extend outside the cone, and will arrive at the coast sooner than the eye," the National Weather Service warned. Virginia Governor Ralph Northam's office predicted "catastrophic inland flooding, high winds and possible widespread power outages," cautioning that the deadliest risk would come from flooding. The US Navy said it was preparing to send about 30 ships stationed in Virginia out to sea. The vessels will get underway from Naval Station Norfolk and Joint Expeditionary Base Little Creek to avoid potential damage from winds and tidal surges, said Colonel Rob Manning, a Pentagon spokesman. Heavy rain in the Washington area over the weekend has already led to flooding in historic Alexandria, Virginia, and the National Weather Service issued a flood watch for part of the Potomac River. North Carolina Governor Roy Cooper's office said Florence is already being felt along the state's coast, with large sea swells resulting in life-threatening rip currents and surf. "This is a huge storm," said Robert Woodward, chairman of the Dare County Board of Commissioners, predicting 15 to 20 inches (38 to 50 centimeters) of rain. "Never have we seen quite this type of a storm approach us." At this height of the Atlantic hurricane season, Florence was being trailed on east-to-west paths by two other storms, Helene and Isaac. Helene -- 535 miles west of the Cape Verde islands off the African coast -- had winds up to 110 miles per hour, and was expected to continue moving west-northwest for several more days, the NHC said. Isaac -- which late Sunday became the fifth hurricane of the season, but was later downgraded to a tropical storm -- is heading west toward the Caribbean. Despite the slight drop in maximum sustained winds to 70 miles per hour Isaac was expected to be at or near hurricane strength as it passes near land later this week. 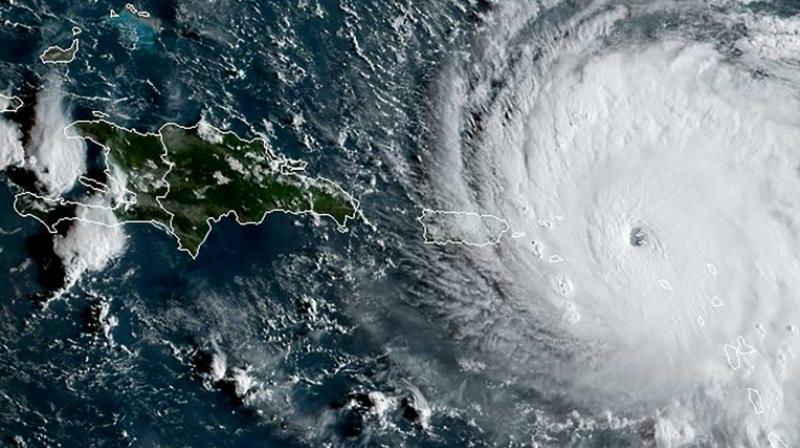 The storm was about 960 miles east of the Lesser Antilles -- a region still recovering from last year's powerful Hurricane Maria.